The TR-004 4-Bay USB 3.0 RAID Expansion Enclosure from QNAP is unique in that it allows you to expand the storage capacity of not only your QNAP NAS, but also your host Windows, Mac, or Linux system. Use it in this fashion as a DAS (Direct-attached Storage) and access its content simply by connecting it to your system using its integrated USB 3.0 Type-C port and the included USB Type-C to Type-A cable. The TR-004 features four hot-swappable 3.5" SATA drive bays that support 3.5" and 2.5" hard drives, as well as 2.5" solid-state drives. The drive bays can be configured hardware- or software-controlled RAID 0, 1, 5, and 10 modes, each of which offers performance, data redundancy, or a combination of both. For those who do not require a RAID, Individual and JBOD modes are also available. The brings you a reliable and secure storage capacity expansion solution that supports data transfer speeds up to 227 MB/s and keeps cool using a 120mm smart fan. The TR-004 is an ideal storage expansion solution, especially for laptops which lack the ability to install larger, higher-capacity drives. Featuring four 3.5" SATA drive bays and supporting multiple RAID configurations, the TR-004 provides the ability to store a vast number of files and data and to ensure protection against potential drive failure. The TR-004 supports a variety of RAID configurations. Depending on your requirements, you can switch between hardware- or software-controlled RAID modes. Move the DIP switches to corresponding positions for your desired RAID mode: Individual, JBOD, RAID 0, RAID 1/10, or RAID 5. You can also configure the RAID settings from your QNAP NAS, or by using the QNAP External RAID Manager utility on your computer. Individual Mode treats every disk as separate storage, allowing you to independently access each one. In JBOD mode, all disks are recognized as a single drive, which allows maximum storage utilization, but provides no data protection. RAID 0 splits data among the drives and provides the fastest performance, but does not protect data against drive failures. RAID 1/10 uses half the total storage capacity to store data and the other half for 1:1 data redundancy. This provides high data protection at the cost of only being able to use half the installed storage space. RAID 5 requires at least three drives to use and parity information is distributed among the drives, providing optimized storage capacity and protection against one disk failing. All of these RAID modes are hardware controlled, but there is also a Software Control mode to configure the RAID from your NAS or computer. Compared with other RAID enclosures, the TR-004 provides software-controlled configurations for greater management flexibility. Users can configure RAID and monitor disk health using Storage & Snapshots Manager on a QNAP NAS, or by using the QNAP External RAID Manager utility on their computer. Use Storage & Snapshots Manager to configure the TR-004 as a storage expansion unit for your QNAP NAS. In addition to RAID configuration, the NAS expansion storage mode supports various NAS functions, including storage pools and snapshots. By choosing external storage mode, you can use the TR-004 as a DAS. The QNAP External RAID Manager is a utility for Windows and Mac users to set up, monitor, and view the status of the TR-004. Users can easily configure RAID groups on the TR-004 and quickly obtain the status of RAID performance and health at a glance. Note: When connecting the TR-004 to a NAS, users can choose to use either the NAS expansion storage mode or the external storage mode. The TR-004 meets many storage expansion requirements for home and work use, including expanding the capacity of your NAS, serving as external storage for your NAS, expanding the storage space of your computer, and cross-platform file sharing. The TR-004 provides an alternative method for users to expand their NAS storage capacity. By connecting the TR-004 to their NAS and using the Storage & Snapshots Manager, users can easily configure and manage their storage expansion. The TR-004 supports a variety of QNAP NAS storage and file management functions, allowing users to build storage pools, find files with Qsirch, and organize files with Qfiling. 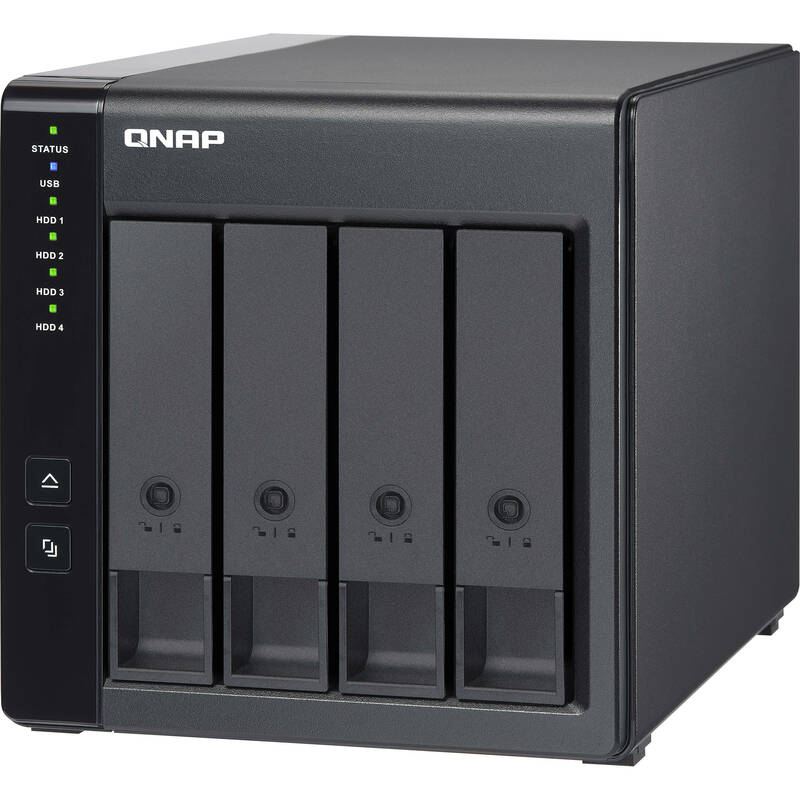 Instead of using the TR-004 to expand the capacity of your QNAP NAS, you can use it as a complimentary storage unit for backing up or moving data. It also allows you to physically migrate huge data collections that would require significant network bandwidth. While connected to the NAS, you can monitor the health and status of the TR-004 by using the Storage & Snapshots Manager on the NAS. The TR-004 can quickly add storage space to your computer. You can use the DIP switch to configure a hardware RAID mode or manage it by using the QNAP External RAID Manager utility. The health and status of the TR-004 can also be monitored by using the QNAP External RAID Manager utility. From your NAS to Windows, Mac, and Linux computers, the TR-004 is compatible with a wide range of devices. This is good for quickly moving large files between different devices. The TR-004 is even compatible with devices that use the exFAT file system, adding further convenience for accessing and sharing files from a wider range of devices. Note: To access devices that use the exFAT file system, users must purchase a separate exFAT driver license. As an external hardware RAID device, the TR-004 operates independently and does not require additional NAS system resources. When compared with the UX-500P expansion enclosure, the TR-004 uses less NAS system resources. Box Dimensions (LxWxH) 12.4 x 12.1 x 10.0"
TR-004 4-Bay USB 3.0 RAID Expansion Enclosure is rated 4.5 out of 5 by 2. Rated 5 out of 5 by Justin from Easy to way to expand storage I had some old drives lying around I wanted to use together as a RAID volume but I didnt really want to upgrade my NAS to a larger enclosure. Being my existing enclosure was a QNAP this was an easy way to add capacity to my existing system seamlessly. Super easy to install and configure from my existing NAS system, requiring only power, USB3.0, and the drives installed to get going. Rated 4 out of 5 by Warren from So far so good Easy setup. Only used for a few weeks but pleased with operation so far. Assuming the dip switches are configured properly, could I take 4 discs from bit older QNAP NAS and load the external drive enclosure with those drives and not have the drives reformatted?